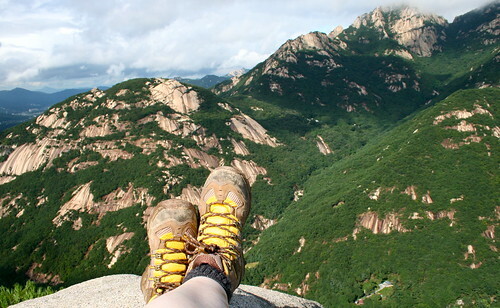 Hiking is a favourite pastime in Korea. Koreans of all ages love to don their hiking uniforms, thrown on a backpack, and head for the hills. 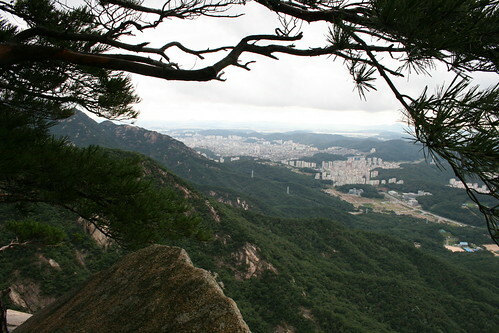 It is perhaps not surprising, then, that Bukhansan National Park, which spreads across the North of Seoul and into the surrounding Gyeonggi province, has been distinguished by the Guinness Book of Records as being the national park with the highest number of visitors per square foot. So this past Sunday I was surprised when I went hiking in Bukansan, the busiest national park in the world, and found myself constantly reassuring other people that I was ok by myself. After all, you’re never really alone on a hiking path in Korea. Still, all along the mountainside I met people who were shocked that I was hiking the trail by myself. “Be careful!” they all cautioned. My day started out pretty normally. I had purchased some new hiking boots the previous day and I wanted to break them in before I took them to Taiwan. I figured I would take a leisurely stroll, duplicating a hike that I took back in February. Unfortunately, when I got to the park I learned that the trail I wanted to take was not open. So I looked at the map and I decided on another rout. 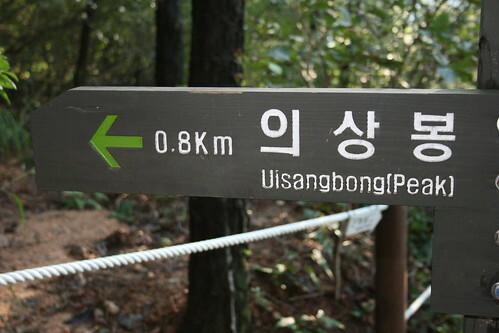 The trail to Uisangbong peak was only 1.5 km, which seemed like a very do-able 3 km round trip. The trail started out as a very easy walk through the woods with a moderate incline. However, about one kilometre into the trail things got rockier and a bit more fun because there was scrambling and climbing involved. This was when I started seeing groups of people resting and started getting offers to sit and take a break with their various parties. I kept on hiking though. After a few hundred meters, the terrain became much more difficult. At one point I couldn’t figure out how to keep going up. I started to wonder if maybe I had left the trail by accident. So I did what I do when I’m unsure: I ate. I pulled myself up on top of a big rock and I sat and ate an apple. While I perched on my rock, some other hikers came by and after seeing their route I figured out the best way to continue on the trail. The other view from my perch. At some points the incline was so steep that I literally had to use the cables to pull myself up. (Normally cables and ropes are intended for the descent.) In other places I had to jump and pull and push myself up various rock faces. After a few bumps and scrapes, I did make it to the top — I think. I’m not positive that I was at the peak, but I’m content to believe that I was. I had a nice few minutes at the top, enjoying the views of Seoul and Goyang, before heading back down the mountain. About a quarter of the way down the trail I met yet another man who told me to be careful. I was about to issue the standard “thank you and I will be careful,” when he continued talking. He explained that this was one of the most difficult courses on the park. Huh. Go figure. The popularity of hiking in Korea means that hiking here is not the same as going for a hike in Canada. The biggest difference, of course, is that you are almost guaranteed to see at least some people, no matter when you hit the trails. There is also the fact that anywhere you go in Korea, even amongst the most remote rice paddies or mountains, you will have cell phone reception. There is no escaping society in that sense. And yet, while those two things are my biggest complaints about hiking in the Land of the Morning Calm, they are also the things that let me safely hike by myself. 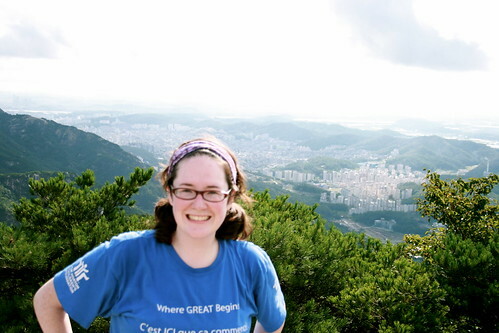 Even if Koreans continue to think that I’m a total oddball for doing things like being a woman and hiking by myself. Look at the brilliant job I did focusing on the shrubs behind me! I, too, have found that a leisurely munch would solve most existential conundrums. Did you figure out WHY your trail companions were on the trail? Did you understand why YOU were on the trail (oh, let me guess… a chance to stray OUT of cell phone range)? I am so glad you headed up the trail and found it so liberating. Keep putting one foot in front of another, especially when it is not observed and extends your grasp. 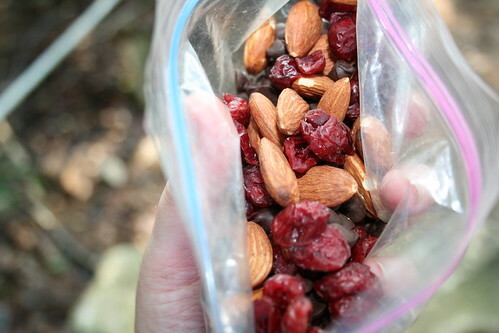 Why is it that food on the trail tastes so great? Got more ideas for adventure? Yipppeeeee! Go for it.